We can send library items from one Germanna campus to another through InterCampus Loan. We can probably get it for you from another library through Interlibrary Loan. The library carries a limited selection of textbooks in our course reserves, which can be used in the library for a specified period of time, usually two hours at a time. Check at the library help desk to see if the textbook for your class is on reserve. With a library card, you can borrow books and other items from the Germanna Libraries! 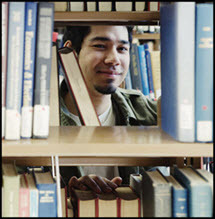 The Germanna Libraries extend borrowing privileges to all GCC students, faculty, staff and community members who are 18 years of age or older and are permanent residents of Germanna's service region. For additional information about library cards and borrowing privileges, see below. Visit the Library Help desk at any GCC campus library to get a library card! For students, faculty, and staff: your GCC ID card is required to activate your library account. The first time you borrow items, you will need to fill out a short library card application. For community members: you will receive a Germanna-issued library card after completing your library card application. Your permanent address must fall within Germanna's service region to receive a community member library card. A GCC ID card or a community member library card must be presented in order to check out materials. Materials will not be checked out to patrons who present another person's GCC ID or community member library card, including spouse's and other family members. Items in all circulating collections are eligible for check out. Reference materials, periodicals, special collections, and other items not in the circulating collections do not circulate. Students: 1 week loan (7 days), plus three one week renewals (21 additional days). Renewals will not be granted when there are patrons on the laptop waitlist. Materials may be returned to any GCC library help desk or book drop box. Faculty and staff members may recall items currently checked out for the entire semester if the item is needed by a student for research or a related course assignment. The patron from whom the item is recalled will be permitted to keep the item for 3 weeks or for the remainder of the loan period, whichever is shorter. Three overdue notices will be sent at 10 day intervals. If materials are not returned after 3 overdue notices, a bill for the replacement costs of the items will be sent to the patron, and a hold will be placed on the patron's account. Lost or damaged materials should be reported promptly. Overdue items and/or unpaid fees will result in the loss of library privileges. Unpaid fees will be submitted to the state for collection. If you have questions about circulation or other library policies, please give us a call, send us an e-mail, or stop by one of our library locations. A valid Germanna student, faculty or staff ID card must be shown at the time of check out. Laptop loans are limited to students only. Faculty and staff may not borrow laptops. Community borrowers are not eligible to borrow Germanna Libraries equipment. Equipment may not be loaned by the borrower to another person. Privileges to borrow library equipment may be suspended or revoked due to repeated late returns of equipment and/or returning equipment that is damaged or otherwise no longer in working condition, including loss of critical components. Germanna Libraries equipment is intended for academic use. This use must conform to the VCCS Information Technology Ethics and VCCS Computer Ethics Guidelines. These policies can be found at http://www.germanna.edu/catalog-and-student-handbook/general-information/. The loan period for equipment is one week (7 days). Each renewal is for an additional one week (7 days). Laptop renewals are limited to 3 per borrower per semester. This means a borrower may borrow a laptop for a maximum of 28 days each semester. Borrowers may not leave library laptops or iPads unattended. Borrowers will be held responsible for any illegal or illicit network activity that occurs while a laptop or iPad is checked out under their name. All personal files must be removed from laptops or iPads before they are returned. Germanna Libraries staff are not responsible for transferal or storage of personal files saved on library equipment. Borrowers may not attempt to repair laptop or iPad malfunctions. Laptop or iPad malfunctions must be reported to library staff. Borrowers are encouraged to return damaged or malfunctioning equipment as soon as possible. Laptops and iPads must be returned to the library branch from which they were borrowed. Laptops and iPads may not be returned locked or with personal access codes in place. Laptops and iPads must be returned unlocked in the condition they were issued. The repair/replacement charge for lost, stolen or damaged equipment will be posted to a borrower’s account in the Student Information System (SIS) and will be due in full within 30 days of posting. Repair/replacement charges may result in a hold being placed on a borrower’s record in the Student Information System (SIS). SIS holds will be lifted once proof of payment is provided to Germanna Libraries staff. Repair/replacement charges not paid after 30 days will be handled in accordance with Germanna Community College’s Policy on Delinquent Accounts. There are no overdue fines. However, the replacement fee for a lost item is $50 per item plus a $10 non-refundable processing fee. If library staff inspect a damaged item and deem it "still able to circulate," the fee is $10 for excessive highlighting/marginalia and/or light to moderate damage. For information about fees associated with lost or damaged equipment, such as iPads and laptops, see the "Equipment Use Guidelines" on this page.